Having a child in private school is expensive. Some families are blessed being able to afford the tuition, while others need assistance. This is one of the reasons we are so thankful we exist, to help families financially who desire to make a choice in their educational provider. You might have a student who has just been diagnosed with a learning disability or you simply want to put your child in the best school for them. Nothing should deter you from doing what is best for your child. Especially when the APESF staff is here to partner with you and give you the tools to be successful. At APESF, we have four different types of scholarships (Original, Overflow, Low-income and Disabled/Displaced). Original and Overflow scholarships come from individuals who utilize the state tax credit. Every individual donor has the opportunity to recommend a specific student when making their donation. Your chances of receiving a scholarship increase when you are able to get family, friends, and neighbors to take the dollar-for-dollar tax credit and recommend your students. We understand talking about the Private School tax credit program might be difficult for some parents, so we have compiled a list of ways to help you communicate and ask your community to utilize the tax credit. The best way to help your potential donors understand the program is having a face-to-face conversation. You can explain the tax credit program, answer questions, talk about your student(s) success and walk them through how to donate. A great way to start the conversation is watching the Donate Video together. Remember, you are not asking for a donation, this is a dollar-for-dollar tax credit donation and this is allowing your community to have a say in where their tax dollars are going. 3 – Under the Recommendations Box, select Specific Student(s). Make sure to include your student(s) name and school. Do not forget to thank your donors for considering to donate. As a reminder, APESF does not inform parents when people donate and does not give out donor information. If you receive an award and want to thank the donor, we suggest sending a thank you email to everyone. The thank you email could also give others who forgot to donate the first time, a chance to make the donation. You can send reminders throughout the year or whenever you see fit. Do you have a Facebook or Twitter? It is an easy opportunity for you to inform your friends/followers that they have a choice in where their tax dollars go. They can choose to take the Arizona State tax credit and at the same time, assist your family. Make it easy on them and provide the donation link. You can also make the post personal by providing information and a picture of your student(s) at school. A great thing to carry with you or have in your car is our donation brochures. They have all the information a donor would need and all you have to do is place your student(s) name and school in the recommendation box. You can pass them out when you are having discussions with friends, family or co-workers. We would be happy to send you some brochures, just complete the form here. 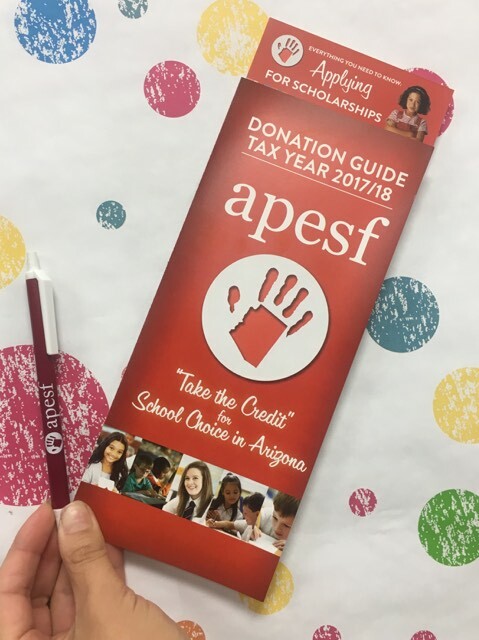 APESF believes everyone should take advantage of the private school tax credit program in Arizona. It is an opportunity for the donor to make a difference in a child’s life and have a say in where their tax dollars go. If you or your donors have more questions, please go to apesf.org or call one of us today at 480-699-8911. ARS 43-1089 NOTICE: A school tuition organization cannot award, restrict or reserve scholarships solely on the basis of donor recommendation. A taxpayer may not claim a tax credit if the taxpayer agrees to swap donations with another taxpayer to benefit either taxpayer’s own dependent.